It's time for another Spry Ad! Actually I don't think I ever had one to post before since I have a hard time finding them. I can't really make fun of these ads too much because the Spry Cookbook has been so valuable in instructing me how to cook with shortening. Well that's a great thing since that's what it's original writers intended but for me it's different. Housewives of the 1930's were used to cooking with fats like shortening and lard but after so many years in the grips of the food Nazi's and a health profession that performs "Studies" whored out to the highest bidder we have a nation that is fat shy. Indeed we cringe at the mere thought of cooking with fats like Nosferatu seeing a crucifix. Now the real worry for some time has been trans-fats and with good reason. It caused us to shun many oils and all shortenings and crammed us into the impossible position of frying our food with olive or grape seed or flax oils which are in and of themselves finishing oils not very tolerant of high heat. Well the food Nazis were good for something I suppose as they heralded the charge against trans fats (caused by hydrogenation), so now they are removed. For years shortening like Crisco, Snowdrift and Spry were all shelf stable with the hydrogenation that created trans fats so it was a simple thing to my mind to just go back to doing whatever you were doing before you decided to start poisoning us in the name of profit. 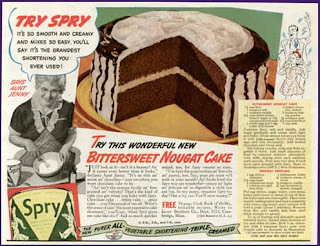 I was intrigued when I first found the spry cookbook (What Shall I Cook Today?, 1935) online. It made me curious as to what difference shortening would really make when baking your own cakes and frying foods. The reality is it's a big difference. Cakes come out more tender than with liquid oil and foods fry up crisper and less greasy as well. I'm a convert now and while I still keep peanut oil around for the occasional deep fry meal, I use Crisco for most everything else. I give a heartfelt thank you to Recipe Curio for preserving such a wonderful resource online so future generations can benefit from the sage advice of Aunt Jenny. PS - Unfortunately the scan of the ad was too poor for me to get the recipe for the cake, if anyone has this recipe in their collection I would love it if you could share with me.